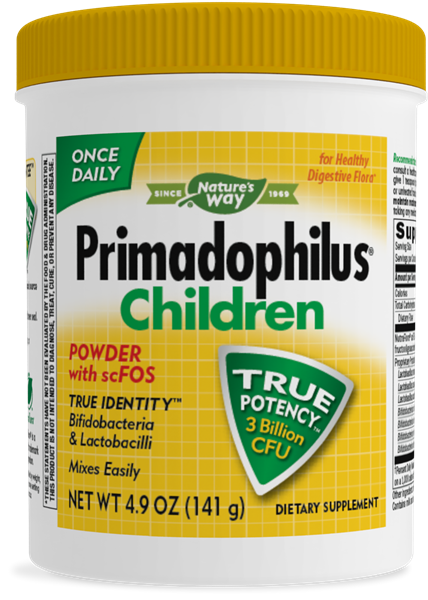 Primadophilus for Children / 5 oz Pwdr - Nature's Way®. Children under 2 years of age, consult a healthcare professional before use. Not to be used in premature infants. Children 2 years of age and older, give 1 teaspoon (3 grams) daily between meals. May be added to cold drinks or unheated foods such as cold cereal, yogurt or applesauce. Keep refrigerated to maintain maximum potency. If taking any medications, consult a healthcare professional before use.